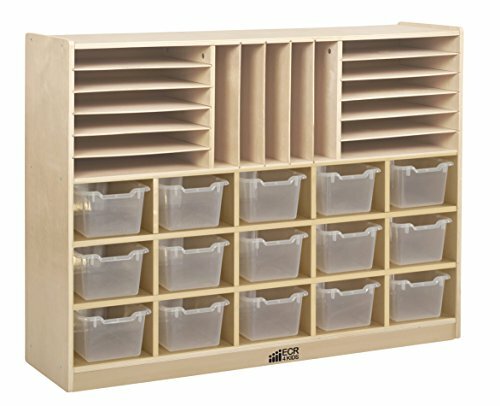 The ECR4Kids Multi-Section Storage Cabinet is an attractive and unique storage option for a classroom. The 15 cubbies are the ideal storage place for a younger classroom. The cubbies keep children's items organized at the perfect height. Little one's can store their art projects, individual items, homework and more in their own personal space. 15 clear color bins are included to make this unit both functional and attractive. Above the cubbies is storage for art supplies, paper, homework and more. Constructed of durable birch hardwood, the cabinet features an attractive natural finish. Heavy-duty casters are included for mobility. ECR4Kids Birch Storage Cabinets have achieved GREENGUARD [GOLD] Certification and are CPSIA-compliant for safety.